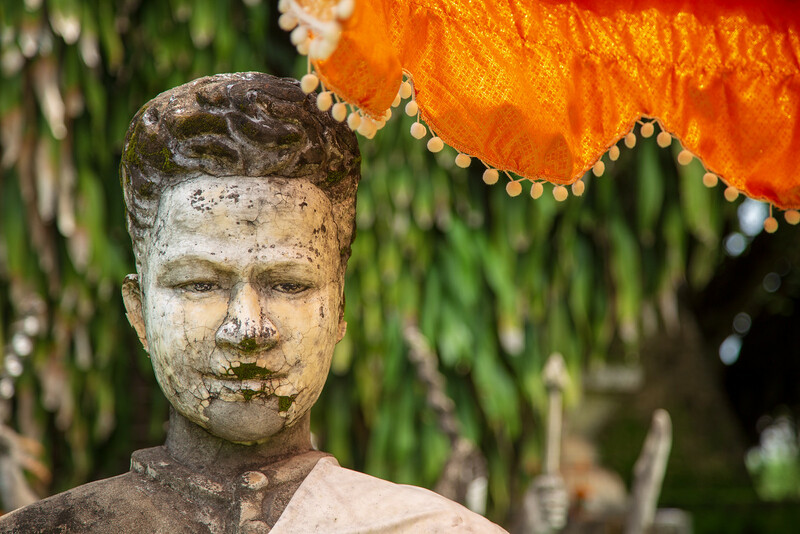 If you are staying in Vientiane, Lao’s capital for more than one night, consider a visit to the weird and wonderful Buddha Park, also known as Xieng Khuan. It’s a small park, filled with more than 200 Buddhist and Hindu sculptures. The park is located 25 kilometres from Vientiane city, quite close to Friendship Bridge where you can cross over to Thailand. It’s very easy to reach by bus or by tuk-tuk, but more of that later. 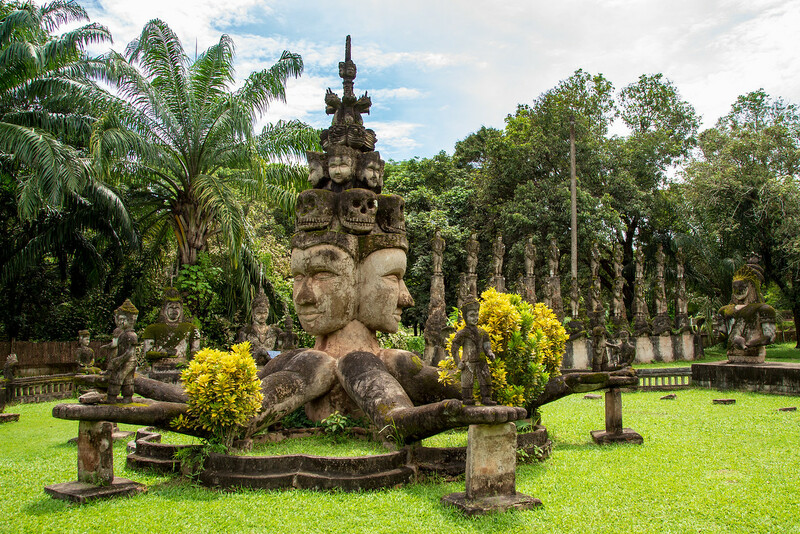 Buddha Park was created by monk Luang Pu Bunleua Sulilat in 1958. 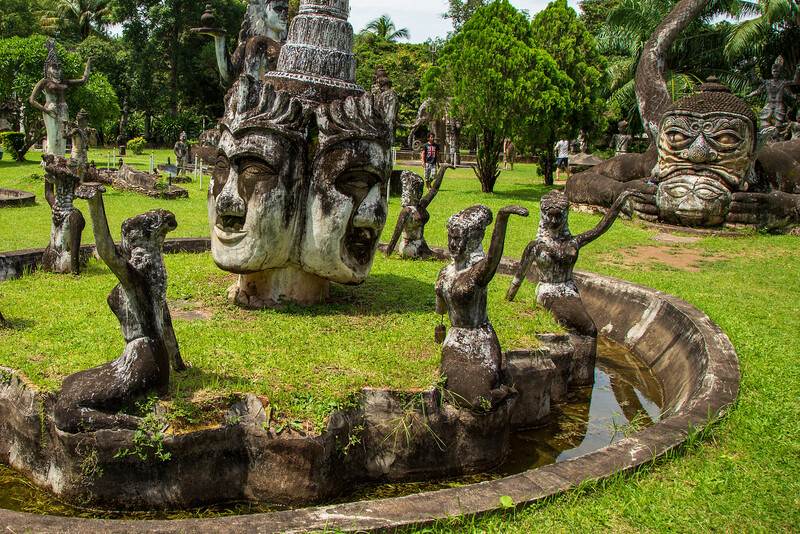 The sculptures scattered throughout the park include many characters from Hindu mythology, Buddhas, and demons. The main focal points of the park are a large pumpkin-like structure which represents earth, heaven, and hell. 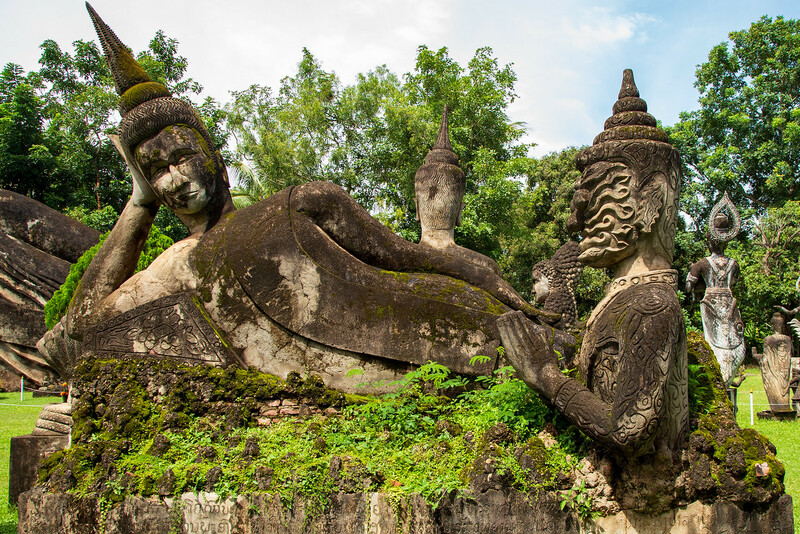 You enter through the demon’s mouth and can climb to the top for views over the park and the Mekhong river, and a 390 foot long reclining Buddha. It’s an interesting place to explore for an hour or two. There’s a small restaurant by the river offering simple local Lao food and light refreshments. Many of the guesthouses and hotels in Vientiane sell trips to Buddha Park in a shared tuk-tuk but it’s very easy and much cheaper to travel independently. Head to the central bus station in Vientiane, located by the morning market and take bus route 14. The bus has Buddha Park written on the front in English, so it’s easy to find. The price is currently 8000 kip (about $1) and will drop you off right outside the park. Buses depart quite regularly throughout the day. If you feel brave, rent a motorbike for the day. Some previous experience riding a motorbike would be useful, Laos is probably not the best place for novice drivers. Come off the busy main Tha Deua Road and explore the local villages. It’s fun but avoid coming back this way after dark. The roads are dark and are full of potholes, dogs start chasing you, buffaloes walk out in front of you, but in the daytime, it’s a fun adventure. 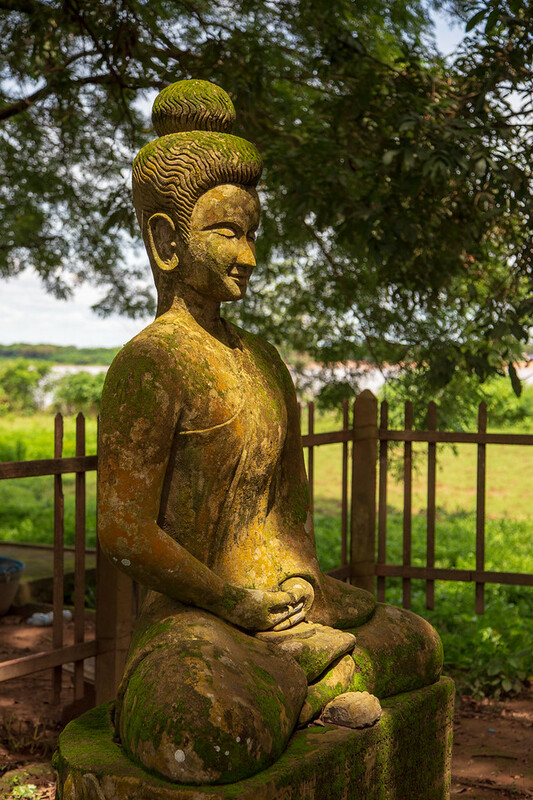 How much does it cost to enter Buddha Park, Vientiane? Entrance fee is 15000 kip per person (about $2). If you arrive by motorbike, there’s an additional 3000 kip fee for parking. Very unique park. Loved going to the top of the “pumpkin” The bus ride there was a bit of a kidney buster as they were paving the road but we still had a great day there. It was weird, but we really liked it. We took the motorbike out and had fun avoiding all the potholes. A great place to visit Jonathan, no doubt about that ! We had a great time there and views across the Mekong are also quite wonderful, when we visited there was a dragon boat practicing – they have a very distinctive style in that two or three guys at the back stand and adopt this sort of overarm ‘windmill’ movement which is so different to the Chinese style in which I was involved in at the time – fascinating Asia !! I recall the pumpkin mentioned by Pete above, if I remember right the three stories of it are meant to represent hell, earth and heaven – interesting concept !! It was a cool place! Much different than the temple tours. It was just too far on the day I rented a bike. And on my last day I just wanted to relax and wander around town, drinking coffee and eating. It is out there a bit. Seems further when it is hot.